In 1873 the Rev. Dr. J.W. Carhart of Racine designed and operated the first light self-propelled highway vehicle in the United States, and probably the first in the world. He named it the Spark. It was driven by a two cylinder steam engine, steered by a lever, and had a speed of five miles per hour. When his “infernal machine” first appeared, the hideous noise created by its operation caused the people of Racine to threaten to run Carhart out of town. 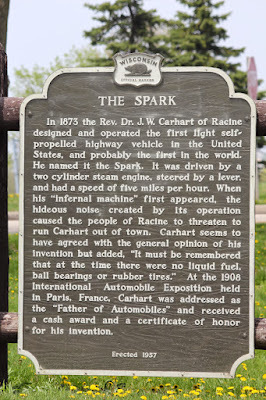 Carhart seems to have agreed with the general opinion of his invention but added, “It must be remembered that at the time there were no liquid fuel, ball bearings or rubber tires.” At the 1908 International Automobile Exposition held in Paris, France, Carhart was addressed as the “Father of Automobiles” and received a cash award and a certificate of honor for his invention. The marker is located inside Pritchard Park, at the intersection of Durand Avenue and South Ohio Street, Racine, Wisconsin 53406. The marker is located inside Pritchard Park.